Pennie and Matthew are talking about homeopathy and its remarkable approach to health this week. Rather than relying on chemicals to control unwanted symptoms or force a particular response, homeopathy treats a person’s health problems by triggering their body’s natural ability to heal. In doing this, two things happen: first, their body is stimulated to correct its own state of ill-health, and, second, it is strengthened to be more resistant to the problem in the future. Far from being a “new age” medicine, Hippocratic writings show that Homeopathy’s effects were known at least 2,000 years ago. It was not until the 1800’s, however, that it was developed into a usable system of medicine by the German scientist and physician, Dr Samuel Hahnemann. Since then, the popularity of homeopathy has steadily increased as people discover its ability to safely prevent or treat the most stubborn of health problems. Homeopathy is gentle and effective. Its medicines, called remedies, are obtained mainly from mineral, plant, and animal sources. These are converted into sub-molecular preparations by a process called “potentisation”, which increases the healing effect of the original substance and removes any toxicity. As a result, homeopathic remedies are energetic medicines free of chemical side-effects. They do not poison, will not interact with other medications, and are non-addictive. They are safe for people of all ages including babies, the elderly and the pregnant. Homeopathic remedies can even be used with animals and plants. Homeopathy is effective for both acute and chronic problems. The correct remedy resolves deep-seated complaints such as arthritic, digestive, and respiratory disorders just as easily as minor ones like headaches, hay fever, and the discomfort of teething. Mental and emotional problems such as jealousy, lack of confidence, depression, panic-attacks, and children’s behavioral disorders also respond well to homeopathy. It truly is a remarkable system of healing. Hope you can join us or this fun and informative discussion. Pennie who is a Homoeopath will talk about some amazing case histories and personal insights of how amazing homeopathy works. Here is an Easter Present for Everyone. Pennie and Matthew will be discussing Inner Balance which is A celebration of self the ultimate coming together of Yin and Yang. Men: Ever wonder why a women gets ‘all emotional’ when you were just a few minutes late? Women: Are you been driven mad when men ask where you’ve put something because they can’t find it. You stop what you’re doing and you find it in less than 30 seconds right in front of them! How many times in our society today do we feel that Men and Woman are in competition with each other? That there is no real communication or connection between us? That Men are from Mars and Women are from Venus? And that we just don’t speak the same language? Join us for an hour of insights, fun and laughter. The 3 levels of consciousness and their roles in our everyday life. We know the conscious mind which is 10% of our minds/brains capacity and runs our everyday’s living experience, however, 40% of our minds/brains capacity is our subconscious mind so what is its job? Pennie and Matthew will discuss it’s and our superconscious minds/brains which is the biggest part at 50% when we make a connection between all 3 levels how that changes our lives and daily living experiences. Both Matthew and I are really excited to be hosting a new radio show which starts this evening. 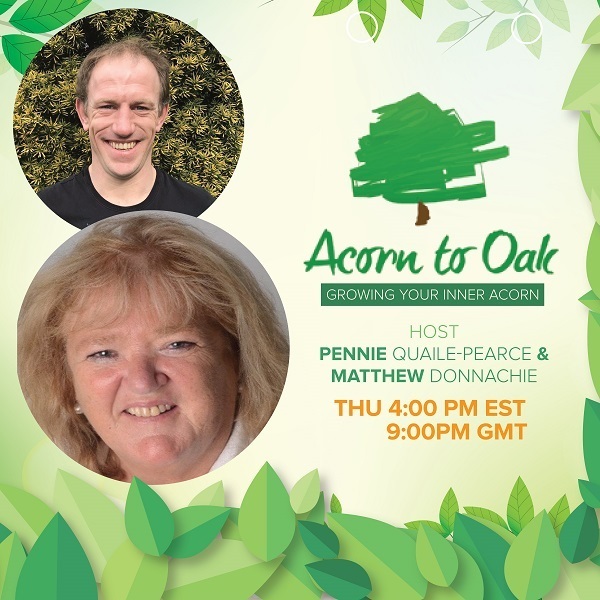 The “Acorn to Oak” show will commence with discussing a road map to energetic models of health and happiness and how they can be used to help in daily living. Includes practical tips and personal insights on how to set up a daily helpful routine.